Isn’t it every kid’s dream to have a pony party? We offer different party packages based on the needs of your birthday girl or boy. Pony rides, hayrides, horse games, a souvenir autograph horse, cake, ice cream, and pizza – all available for the busy birthday families on the go. We keep mom and dad in mind by eliminating the stress of party planning. We also have packages available for the DIY families. Check our party packages below and complete our online form. Our event coordinator will reach out to discuss availability as soon as possible. The Bronze Package includes space rental for 2 hours for up to 15 children plates and napkins and an “autograph horse” for the birthday girl or birthday boy. You may also choose any of the package add-ons. 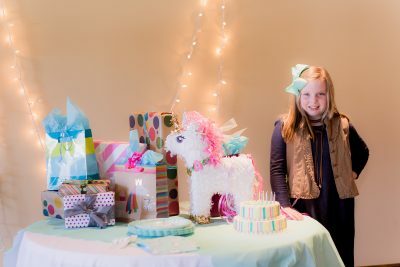 The Silver Package includes space rental 2 hours for up to 15 children, plates and napkins, an “autograph horse” for the birthday girl or birthday boy, pony rides, and horse games. You may also choose any of the package add-ons. The Gold package is our all-inclusive party package. It includes space rental for 2 hours, all needed tableware (plates, napkins, spoons, forks, etc), an “autograph horse” for the birthday girl or birthday boy, pony rides, horse games and a 15-minute hayride. We will also provide a personalized sheet cake, ice cream cups, and two large two-topping pizzas, with either Capri suns, water or canned sodas. This package also includes a happy birthday banner, table cover, 15 balloons, and horse party favors. Are you looking for the perfect venue for your special event? Our rolling hills and spacious new barn might be the ideal place for you to say “I Do.” From weddings to corporate fundraisers and everything in between, let us help you plan your special event. Call Krystle to check availability. Schedule openings limited due to showing and lesson schedule. more information about lessons at Sonny Brooke Stables.